The Brisbane Comedy Festival is certainly not going out with a whimper, with a final week program that includes Judy Hainsworth’s #FirstWorldWhiteGirls: Spirit Animal—a parody of the narcissistic Instagram-able world, featuring two self-obsessed rich white girls. BFF’s Tiffany (Judy Hainsworth) and Maddison (Kyra Thompson) share some legit first world probs—from the heartbreak of Harry marrying Meagan (“I didn’t love him; I just wanted to be a Princess”) to the challenge of creating the perfect flat lay (that’s an Instagram board of your fave items for sale, photographed from above, for those who don’t know). Occasionally “cray,” Spirit Animal is a fascinating review of everything the self-obsessed millennial is likely to care about: the right outfit, the must-have operation, the latest on-trend food to eat (or avoid), and the newest mindfulness and meditation trends… as well as the ongoing demands of Instagram-ing, blogging and YouTube-ing the lot. All interwoven with a darker #MeToo undercurrent, and references to the mental health impacts of trying to live the perfect life in a far-from-perfect world. 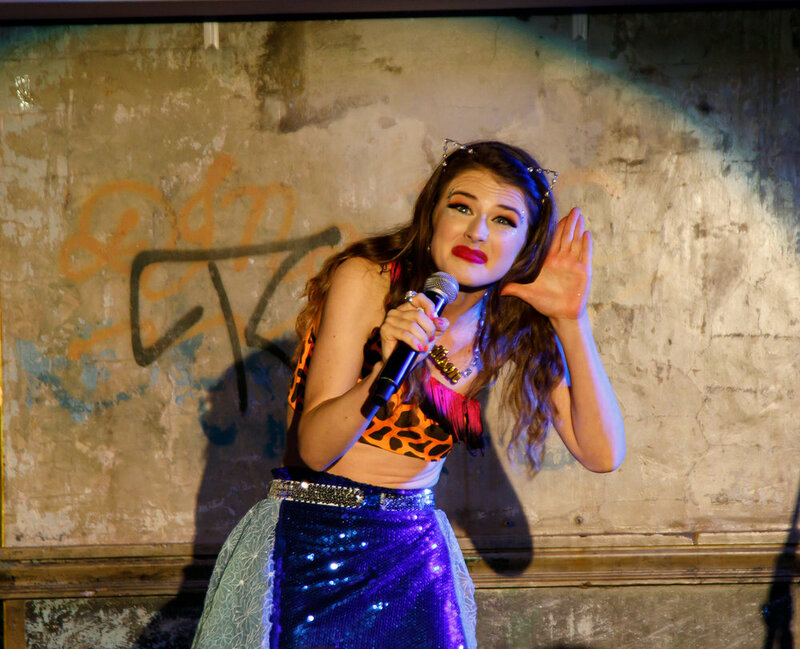 The tightly-written 60-minute show (written by Judy Hainsworth, and directed by Lewis Jones) centres on a number of original pieces—with Disney Princess-style songs (albeit with very ‘contemporary’ lyrics) as well as sprinklings of grunge and rap. Highlights included the crowd-pleasing “I’m better than you,” and the ‘flat lay’ song. Thompson is an excellent foil to Hainsworth’s Tiffany, and the show provides each performer with solos as well as providing some close harmony. I last saw Judy Hainsworth’s work in the fabulous Happily Ever After, and Hainsworth’s versatility and harmonies were also on show in Spirit Animal (both shows under the Musical Direction of Luke Volker). Some of the older members of the audience might have needed an urban dictionary, but I think they got the message (David even stepped bravely on the stage to learn more about creating the perfect flat lay—one of the highlights of the Tuesday night show). Picture: Drawing on the “7% Indian” in #FirstWorldWhiteGirls Spirit Animal (Judy Hainsworth) Picture credit: Geoff Lawrence, Creative Futures Photography. I have a feeling that the show would be better-suited to a later evening slot, as the audience energy seemed to drop a little in the second-half of the opening night of this run. #FirstWorldWhiteGirls Spirit Animal is a closely-observed satire that may occasionally step close to the line between humour and offensiveness (such as the “Little Black Babies” song?). But then, that is when satire is working well: constructively criticising, and drawing attention to issues across society. Go along and see what you think. Verdict: Def one for millennials/Gen WE everywhere. Picture: Kyra Thompson. Picture credit: Geoff Lawrence, Creative Futures Photography. Audience tip: 60 minutes, Brisbane Powerhouse Rooftop Terrace (15+. Sexual references, coarse language, drug references and adult themes). There are six performances of #FirstWorldWhiteGirls Spirit Animal in the 2019 Brisbane Comedy Festival program (6:45pm, 19-23 March—and 5:45pm on 24 March). Tickets $20-$29 ($20 on 19 March, $25 on 20/21/24, & $29 on 22 & 23 March) plus $6.60 transaction fee. Why not keep an eye on the Powerhouse website, and see what else might tempt you (2019 Brisbane Comedy Festival: 22 February-24 March). The reviewer attended the Tuesday 19 March 2019 performance (6:45pm).